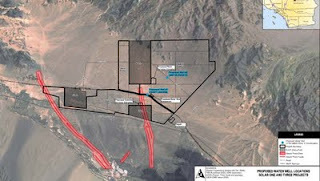 The 850 megawatt and approximately 8,000 acre solar project previously titled "Solar One" proposed for the Pisgah, California area (just east of the Interstate 40 and Interstate 15 Junction) has adopted a new name -- Calico Solar Project as proposed by the newly re-named Calico Solar LLC (formerly SES LLC). 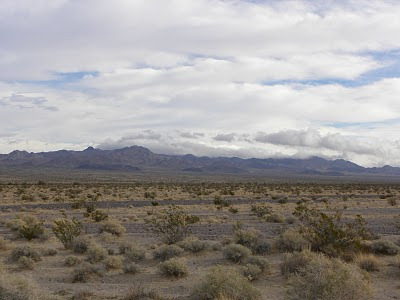 You can read my December posting on the preliminary environmental impact statement for the Calico site, but the short and dirty is that the site is host to the endangered Mojave Fringe-toed Lizard and Desert Tortoise. As many of you are probably already aware, the Federal Government is proposing Solar Energy study areas, whereby the government has designated areas throughout the southwestern United States to evaluate for the suitability of future solar energy development. 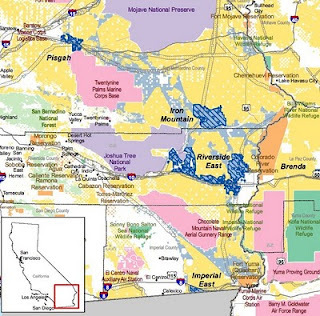 The upside to this program is that it would ideally encourage energy companies to consolidate development in specific areas rather than scattered all throughout the Mojave Desert, although the jury is still out regarding the environmental impact on the specific sites chosen by the Federal Government. You can review preliminary data submitted by Stirling Energy Systems (SES) for its application to build a solar power plant just west of Pisgah, CA along the I-40 and Route 66. The PDF file is listed under "Applicant's Documents" on this California Energy Commission site. Some of the land requested from BLM may have been donated to BLM by the Wildlands Conservancy (former "Catellus" lands). This begs the question, can the Federal Government properly steward land intended for conservation, which presumably was the intent of the Wildlands Conservancy's acquisition and donation.